You can make changes to any eBook in the EPUB format with the free tweak_epub utility. In Atlantis you can have one or multiple address books. An address book in Atlantis is a collection (a list) of postal addresses. Each of these addresses has its title (a name). Addresses should have titles which clearly identify the address itself so that you can easily locate any required address among the available addresses. 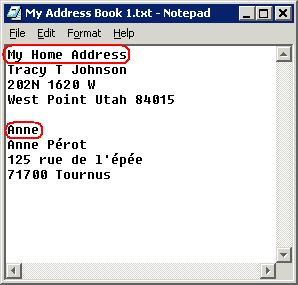 For example, if your address book contains your home address, "My home address" would be a good title for this address. Address books are used in Atlantis mainly for creating envelopes. They are very convenient for printing envelopes for bulk mail (in this case address books work like lists of delivery addresses). You can edit your address books through the Tools | Address Books... dialog. Being ordinary text files, the Atlantis address books can be edited manually in any text editor or word processor. Do so if it feels more comfortable to you. But be sure to adhere to the "title+address+separating line" format as described above. Note that all of the Atlantis address books should be stored under the same folder. The Tools | Address Books... dialog includes information about the current location of your address books. 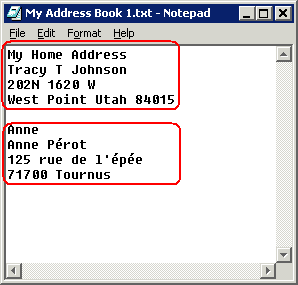 The same Tools | Address Books... dialog allows to create new address books, remove or modify existing books, as well as change location of your address books. You might want to have different address books for different groups of people. You could create a "My Relatives" address book, a "Golf Club Members" address book, a "Business Contacts" address book, etc, etc. For example, creating a "My Friends & Relatives" address book would help you create and print envelopes to send Christmas cards to all of them at once. The "Golf Club Members" address book could be used to create and print envelopes to send invitations to a Golf Tournament. Etc.